Mufreesboro Police Department: $5,000 to fund laptop computers for squad cars to replace obsolete laptops. Garysburg VFD: $3,000 to fund replacement turnout gear for firefighters. Upper Room Assembly Compassion Central in Gatesville: $1,250 to fund heating and electric costs and insulation of food pantry. Aulander Police Department: $4,500 to fund five body armor vests. 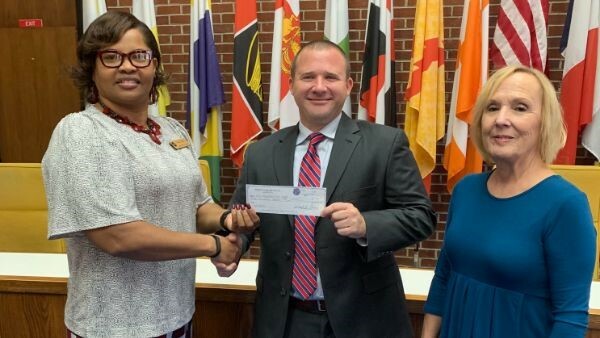 Patrice Jordan of Roanoke Electric (left) presents a grant check to Murfreesboro Police Chief David Griffith and Town Administrator Carolyn Brown. Roanoke Electric awards RoundUp funds to charitable, education and youth development, economic development or community development organizations helping to meet the needs of the needs of underserved populations or geographic areas within the co-op’s service territory.